Amber | Abita Brewing Co.
Amber is a Munich style lager brewed with crystal malt and Perle hops. It has a smooth, malty, slightly caramel flavor and a rich amber color. Abita Amber was the first beer offered by the brewery and continues to be our leading seller. Poured from a draft into a plastic cup on a riverboat on the Mississippi River in New Orleans. Color was murky light brown. There was roughly an inch of head, maybe slightly more. Lots of lacing on the top that lasted throughout each pour. Some film on the sides, but not that much. The plastic probably contributed to that. First smell that came to mind was roasty malts. Bready and grainy as well. Tasted fairly similar to the nose. Roasty, nutty malts. Definitely an amber. Pleasantly bitter. Full body. Thin texture (from memory). Lively (moderate) carbonation. Abrupt finish (from memory). Not a bad beer overall. It was either this or Miller Lite on the riverboat and of course I stuck with the Abita Amber. It also felt right drinking this on the Mississippi. Appearance  This one is a brownish-orange in color with a wonderful head that frothed up nicely. It showed good retention and left some nice lacing on the inside of my Great Lakes Brewing glass. Smell  The toasted malts and ample caramel were evenly balanced. There was a light biscuit in there along with a touch of citrus hops. Taste  It tastes a lot like it smells. The toasty malts and caramel make this one. The hops that I thought I smelled are basically gone, which is all right considering the style. I enjoyed the very light biscuit flavor that I got out of this one. Mouthfeel  This Märzen is light to medium-bodied with a nice balance. Drinkability  This was good on an unseasonably cold winter night in Seattle so I could only imagine what its like on a hot Louisiana day. Comments  Thanks to BigLove for sending me this above-par offering of a nice German Märzen. 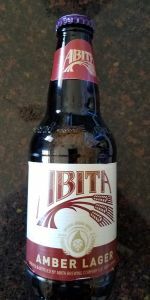 Abita Amber has a beige, slight head, a reddish-brown and very clear appearance, and low to moderate carbonation. Aroma is faint and almost undetectable. The taste is good but not extraordinary. It could even be described as bland. Mouth feel is light and watery. Overall, this is a fairly good beer, but I usually prefer something with more bite. Appearance- Amber orange thin white head leaving a moderate amount of lace. Taste- Is nice and smooth. I wouldsay its medium bodied with nice toasted malt flavor and bitter aftertaste. Good beer. I also liked how it had a best before date on it. I wish all brewers would do that. smell- malt with toasted caramel. drinkability- not bad, but i won't be buying more. Didn't really taste like an amber, good to see its classified as an octoberfest, makes more sense now. Poured into a pint glass. Copper, transparent with half a finger of white head. Smells like honey and lemon zest. A bit of bitterness, though just enough to notice. A touch of sweetness. Crisp and bubbly at first, a little creamy in the latter half, with a lighter body. A well balanced beer that is appealing and easy to drink. A - Clear caramel colored with an off white pillowy head, some lacing and touch of bubbles coming up. S - Sweet and pale malts, with a touch of hops in there. T - Sweet caramel flavor with some pale malt flavor too, touch of hops to balance things out. No breadiness or toasted qualities that I love in ambers. M - Light body with medium carbonation, leaves nice flavor on the mouth. O - Not impressive, but not bad either, a nice easy drinker with a burger or some barbeque. the fourth beer from the abita party pack. a good quarter inch head that quickly disapates.no lacing down the side of the glass.kind of a reddish color.not bad mouthfeel and doesnt taste to bad but for the price id stick with a good american macro brew. Amber from Abita Brewing Co.